Your driveway is the first thing people see when visiting your home. 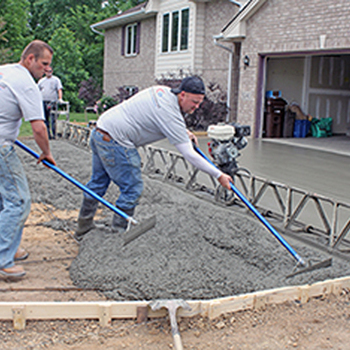 The average driveway has standard gray concrete without any extra finishes. You can add texture and color to your driveway for a more luxurious look all for a very reasonable price. There are a variety of colors, patterns and finishes available to choose from. Create curb appeal and at the same time you’ll be adding a long-lasting surface that requires very little maintenance. Our customers come to us often times because their driveways have cracked and crumbled. They’re looking for low maintenance solutions that will stand the test of time. We only use quality materials for our projects to ensure your new driveway meets all your expectations.